Furnace safety is important for both the home and the homeowners. 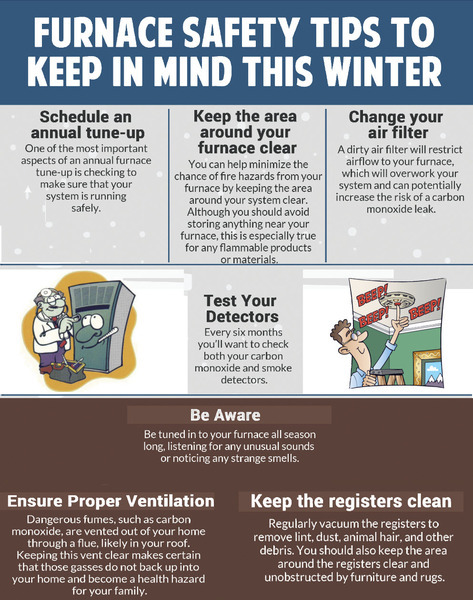 There are a number of things that you can do keep your furnace in top condition year-round. These tips can not only keep your furnace running efficiently and extend its life, they can help to keep you and your family safe. In winter, when you will be using your home heating system even more than usual, it is important that you always maintain your furnace. Even when the weather gets warmer and you stop using your furnace, you should be properly maintaining it so that it is ready when you need it most. From scheduling regular maintenance checks to making sure the area around the furnace is clean and free of debris, it is easy to ensure that your furnace is always running safely and efficiently.